POPE FRANCIS GAVE INVALID SACRAMENT IN EASTER NIGHT MASS 2013? Pope Francis intended to give to 4 persons the sacrament of confirmation. The sacrament of confirmation is the baptism with the Holy Spirit. The baptism is performed by a bishop (priest) praying and laying hands on the one who is to be baptised with the Holy Spirit. BUT POPE FRANCIS DID NOT LAY HANDS ON THE PERSONS HE WAS SUPOSED TO BAPTISE WITH THE HOLY SPIRIT ! This would mean that the sacrament was given invalid to those persons ? Ofcourse the rites of confirmation has been expanded and things have been added. and lay down that in the Latin Church the following are to be observed for the future. THE GIFT OF THE HOLY SPIRIT. So we all can see that there are 2 laying hands on, one is important and the other one is essential. Pope Francis did not lay hands on this persons at all. He only anointed with chrisam. SO IT REALY LOOKS LIKE THE SACRAMENT WAS GIVEN INVALID ! Media went crazy last night and today about Bishop Ralph Napierski entering the Conclave and creating a scandal. Press is claiming that finally the Swiss Guard became aware and arrested Bishop Ralph and did throw him out of the Vatican. And many other crazy details have been added. Now Bishop Ralph explains what really happened and also exposes what is behind all this alleged scandal. 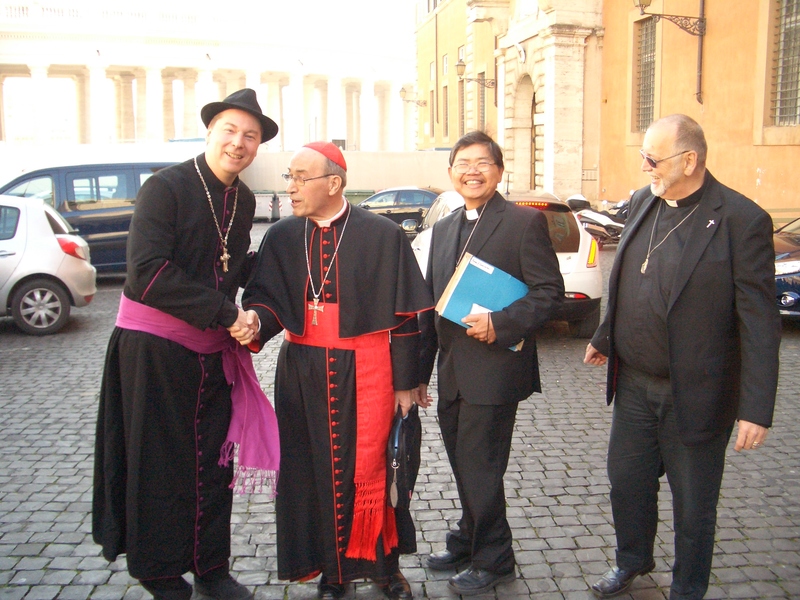 On Monday March 4th I entered the Vatican together with 3 of my priests. We have been checked by the Italian police and by the Swiss Guard and I state that they did their job very well. Of course they did let us pass because we came for a very special reason. I am a Catholic Bishop, the leader of Corpus Dei and I am in union with the Roman Catholic Church and under the primacy of the Pope as soon as there is one again. 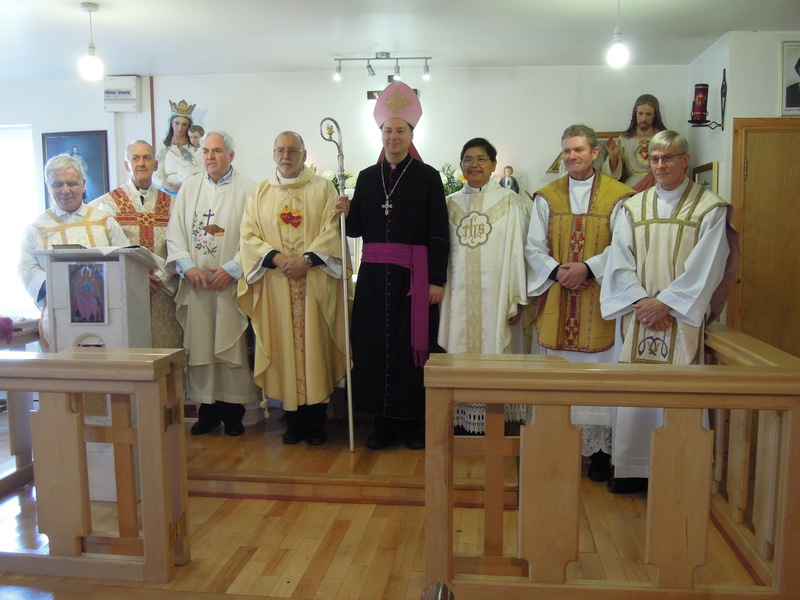 As a Catholic Bishop I founded the Congregation of Our Lady of Refuge. We have 37 Members right now and we have representation in 7 countries. So we did visit on the Monday morning the Congregation of faith to announce the foundation of the new congregation. We have been welcomed by Monsigniore Dr. Slawomir Sledziewski the representative of Archbishop Müller the head of the congregation of faith. The entrance we were directed by the Swiss Guard to use is right beside the entrance of the entrance that the Cardinals used to enter preconclave. And before we entered the building we had a wonderful small talk with Cardinal Sergio Sebiastiana. And a picture from this small talk found its way into world media combined with a crazy story about a scandal that never happened. 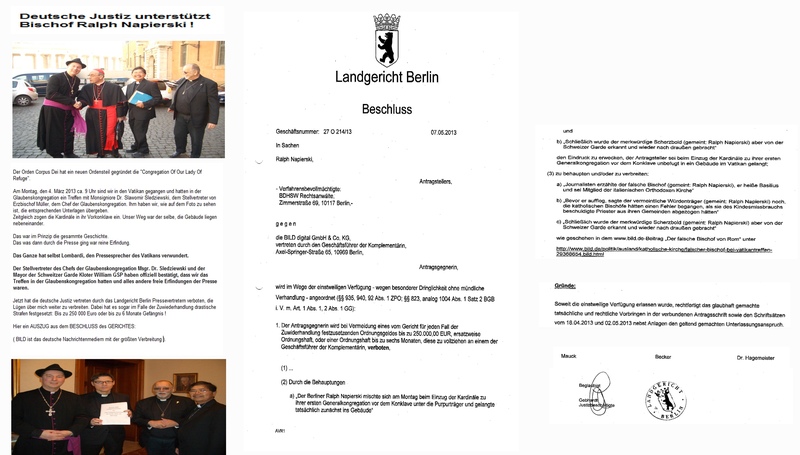 The following WRONG statements can be found in worldpress: That I did entered conclave, busted it, was thrown out by Swiss Guard, was arrested, made announcements about child abuse, said my name was Basilius, claimed that I was member of a non existing Italian Orthodox Church and so on …. But all this never happened. It was a total fabrication. Last night after I saw what happened I went back to the Vatican and I did talk with the leadership of the Swiss Guard. 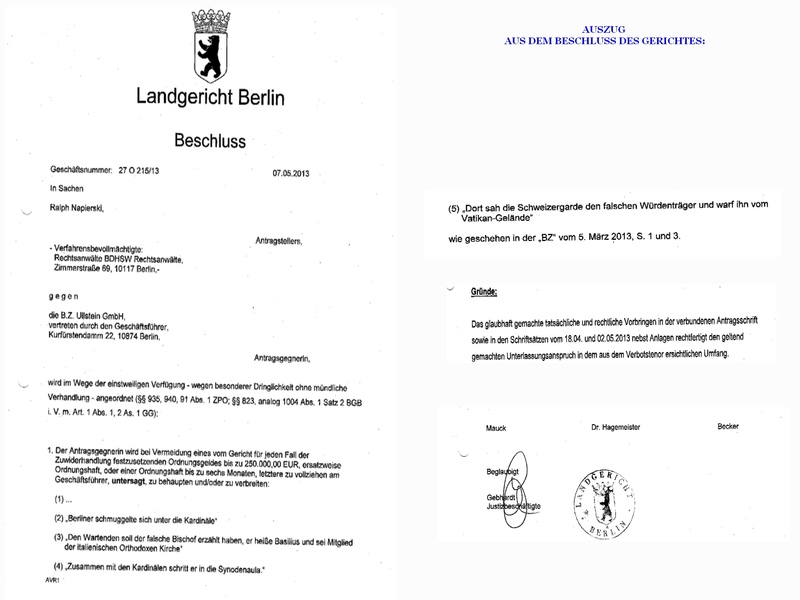 Mayor Kloter William GSP officialy confirmed that all this which was reported by worldmedia never happened. The Congregation Of Our Lady of Refuge has the purpose to support the Union of all Christians and to spread the Gospel of Jesus Christ. 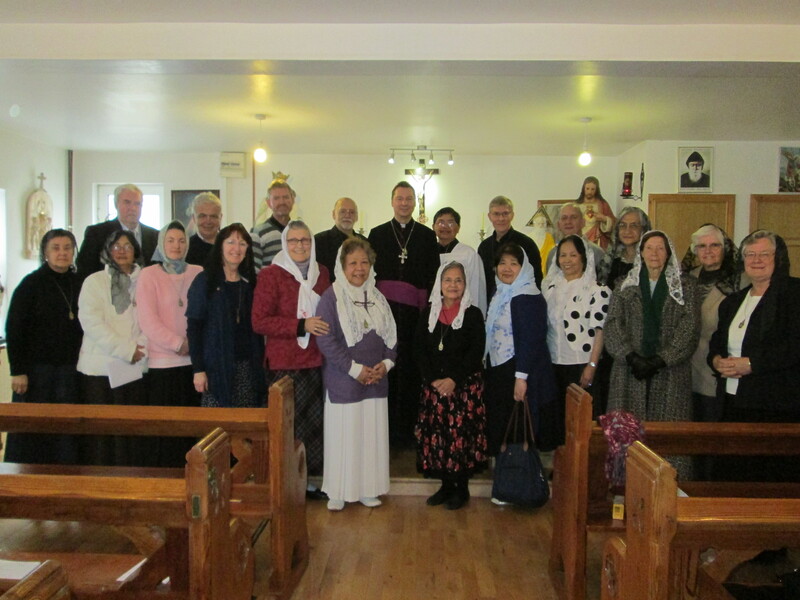 Pictures of the Congregation meeting in Ireland that at which the Constitution has been ratified. Also I would like to thank all the people around the world for that wonderful fan mails and congratulations and I hope you are not too disappointed that all this did never happen. Please use the chance to join the movement of Unity. 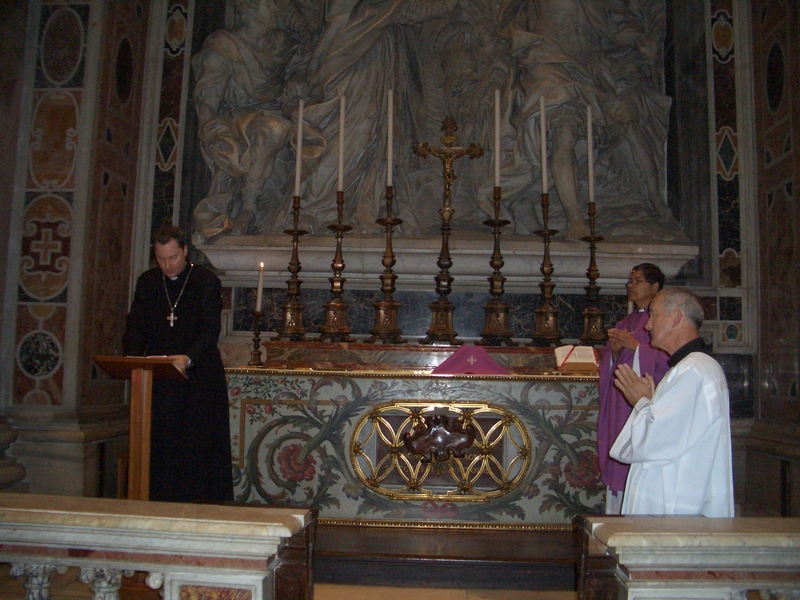 Here are pictures from our mass that we celebrated in St. Peter’s Basilica at Sunday March 3rd the day before we had the meeting in the Congregation of faith. UPDATE: Press is starting to spread the truth ! 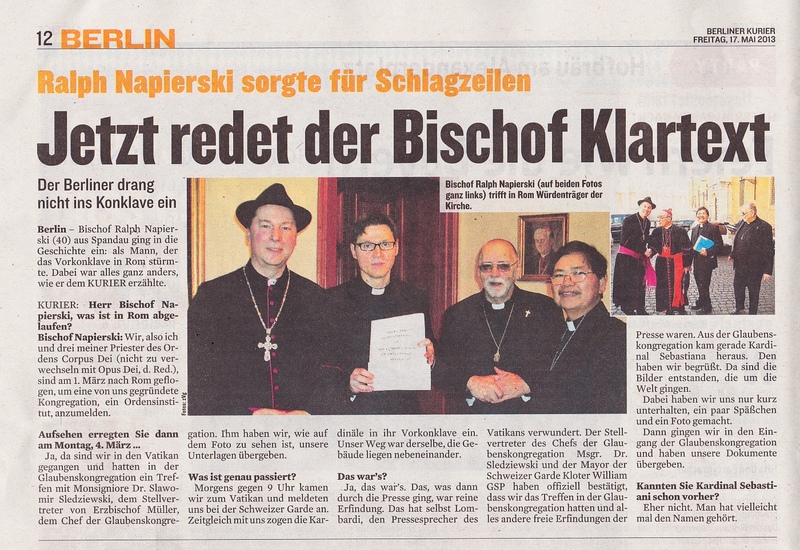 The Bishop from Berlin did not enter (or try to enter) the conclave! 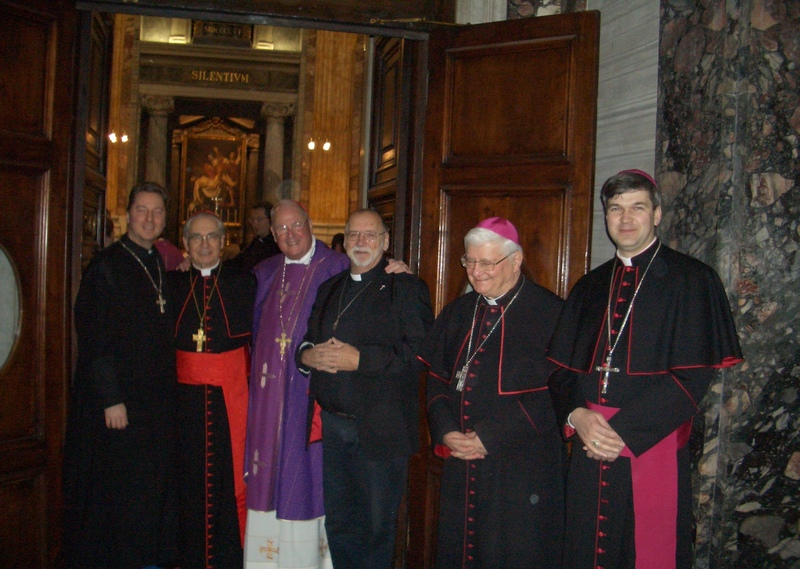 Bishop Ralph Napierski made history: as the man who forced his way in to the preparation for the conclave in Rome! But everything was totally different, as he told the Berlin newspaper KURIER. Kurier: Bishop Napierski, what happened in Rome exactly? Bishop Napierski: Three of my Priests from my Order Corpus Dei ( do not mistake it for Opus Dei) flew to Rome on the March 1st to register a new Congregation, which we had found! Yes, we walked in to the Vatican, because we had a Meeting with Monsingnore Dr.Slawomir Sledziewski,which is the representative of Bishop Mueller the head of the Congregation of Faith. 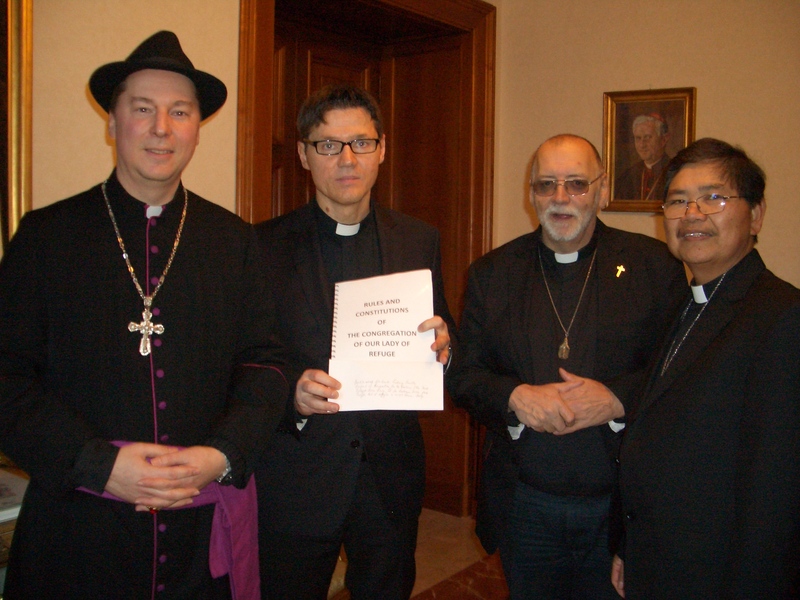 We gave our Documents to him, Monsingnore Slawomir Sledziewski, as you can see on the Picture. We arrived around 9 am at the Vatican and registered at the Swiss Guards Office.At the exact same time entered all the cardinals for the preparation to the conclave. Our way was the same, because the buildings are next to each other. Yes, that was it! Everything what the press worldwide wrote after this, was completely fictitious and invented! Even Cardinal Lombardi, the head of the Press Office from the Vatican was astonished! The representative of the Head of the Congregation of Faith, Msgr. Dr. Sledziewski and the Mayor of the Swiss Guard : Kloter William GSP confirmed publicly that we had our meeting in the Congregation of Faith, and everything else was a free invention from the press!Cardinal Sebastiana left the Congregation of Faith at the same time, we entered, so we greeted him, and that was when the photo was taken, which was going around the world. We had a short talk and made some jokes, laught together and had a Picture. Then we entered fully the Congregation of Faith to hand over our Documents! Did you know Cardinal Sebastiani before already? No, maybe only heard the name .